It's been seven years since I first posted this technique, so I thought it was time to give it a fresh update. Texture plays a major role in my work, and I prefer to create my own textures rather than downloading textures made by other people. Nothing wrong with downloading textures, but creating my own gives me more authorship of my work, and they're fun to make. A texture can be made of anything, lines, dots, scratches. Texture and pattern are related, repeated single elements that create an overall appearance. A pattern is usually an arrangement where the repeat is intentional and easily discernible. A texture is usually an arrangement where the repeat is obscured and intentionally hidden. The Library of Congress has an extensive collection of old photos and prints. I look for pictures and prints that include imperfections and other elements that I think will make good textures. Sometimes I use an old daguerrotype, and sometimes old printed matter like a poster, an ad, or in this case a baseball card. This is Hardie Henderson, a Major League Baseball pitcher from 1883 to 1888(1). I chose this card because I was interested in the dot pattern around the portrait. An RGB image in Photoshop consists of millions or billions of colors. To create a texture using an RGB image, we will first reduce this number, drastically. An image in Photoshop can have different color modes. Basically, CMYK is for images that will be printed and RGB is for images that will be viewed on screen. Grayscale is for images with no color but with values of gray. And Bitmap is for images with no color and no value, only black or white. To reduce the color palette, we will convert this RGB image into an Indexed Color image. Indexed Color mode is for an image with a specific palette of colors. Go to the Image menu and select Indexed Color. 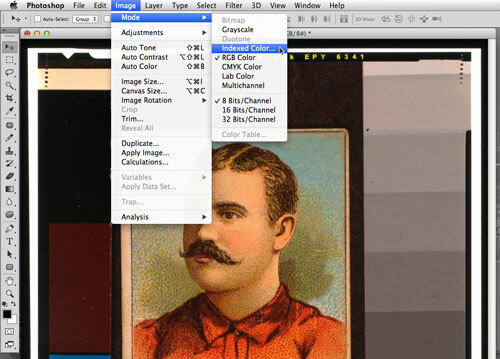 The Palette setting determines how Photoshop interprets the colors. The top group are preset limited palettes. The next set allows you to reduce the number of colors in the palette. I tend to use Local (Perceptual). Sometimes Local (Adaptive) creates a different affect. But it all depends on your image. So experiment and see which one works best for the particular image you are using. In the Colors field, enter the number of colors you want to reduce the image to, in the above example, I've reduced the palette to 8 colors. The palette is being forced to Black and White meaning if I keep reducing the palette down, it will eventually only be black and white. You can also force the palette to Primaries, Web, and Custom. Again, experiment. Dither is a method of creating additional colors by using a dot pattern of other colors. There are four Dither choices, Diffusion, Pattern, Noise, and None. For this demo, I will set Dithering to None. One thing you will notice is that the number of colors you see is less than the number you enter in the Colors field. For example, in the image above, I entered 5 in the Colors field but the image only has two colors. This again depends on your image and the Indexed Color settings you've chosen, so pay more attention to how the image appears rather than the number of colors you've entered. For this image, I decided to go back to 8 colors and then I clicked the OK button to finalize the conversion. The next step is to convert this Indexed Color image back to the RGB color mode. This gives us a better view of the image and allows for further editing options. Changing back to RGB will not add any additional colors to the image. Next, we are going to select a part of the image. Click on the Magic Wand tool, make sure the Control Panel settings for the Magic Wand have Anti-alias and Contiguous unchecked, and click on a color in your image. I will click on a medium gray area of the image. The Magic Wand will make a selection of all of the medium gray pixels in this image. Once this selection is made, I will hold down the Command key and click the letter J to duplicate the selected pixels onto a new layer. This is what I get on the new layer, all of the medium gray pixels, duplicated from the original image. Next, I will select a small portion of dot texture from this layer and use it to build a larger area of texture. To create a texture with the repeat hidden, I want to avoid anomalies, big noticeable chunks, so no mustache, no eyes, no ear, etc. With the Lasso tool, I will select a chunk of the dotted background pattern to the left of the portrait, then Command J to copy and paste it to a new layer. And here it is, that chunk of pasted texture. Now, I'm going to use the Eraser tool to whittle this down to a diamond shape. 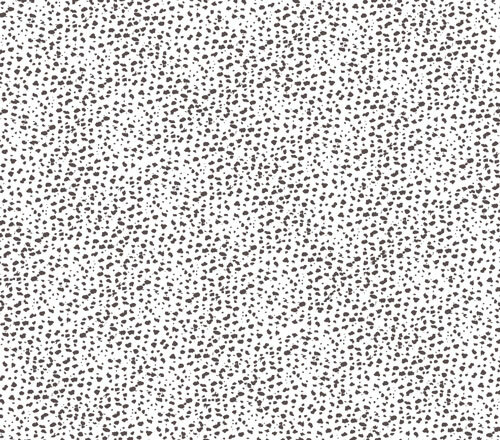 I will also selectively move dots around to make this texture chunk a little more even in tone. Here's the diamond shape. It's the tile I will use to create the larger area of texture. I will manually duplicate this tile and arrange the duplicates to fill out the pattern. I could use a pattern making method for this, but I would rather do it manually so that I can tweak the position of each tile. My goal is not to make a repeating pattern tile, but to make an overall texture that has a hidden repeat. Above is a grouping of twelve copies of the diamond pattern tile. And above is a grouping of 81 copies of the diamond tile. At this scale, I can begin to see the repeat, the lighter area is beginning to stand out as a grid. So if I use this texture at this scale, the repeat might be more visible than I want it to be. At a larger scale though, it should work fine. Like this. If I wanted to spend more time with it, I could go in and manually make tweaks and adjustments to further obscure the repeat. Now, we need to save this file as a Bitmap file. First, we will need to convert it from RGB to Grayscale. Then, convert the Grayscale image to Bitmap. With Bitmap Mode, we have the option of converting the grayscale pixels to either black or white. This is the 50% Threshold setting. We could also choose to use a dither. Similar to dither in Indexed Color Mode, using a dither setting would simulate gray values by using a black and white dot pattern. 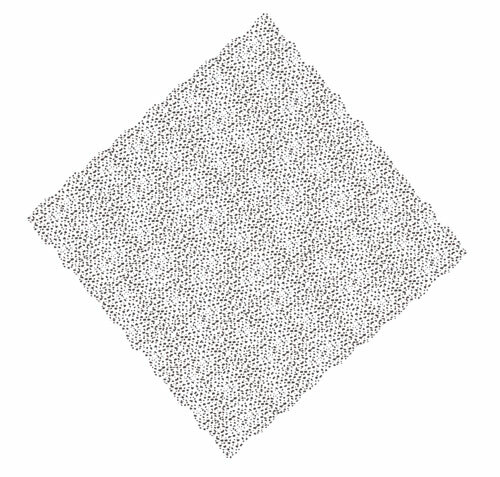 With the Halftone setting, you can specify patterns to be made with round dots, diamonds, ellipses, lines, squares, or crosses, and you can specify the angle and scale of these patterns. Again, experiment and see what works best for your texture. For this demo, I will choose the 50% Threshold setting. Now, to use this texture in Illustrator and change its color to something other than black, save your bitmap texture file as either a psd, tif, or bmp file. The formats that won't allow you to change the color of the the texture are eps, pdf, gif, and jpg. When you place your texture file into Illustrator, only the black will be visible, the white will disappear. Once you place your file, you will be able to change the black texture to whatever color you like by selecting it and changing its Fill color.